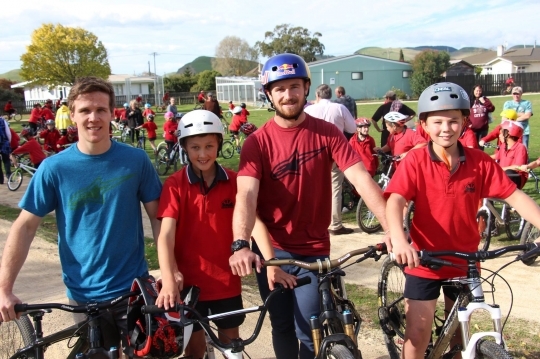 Both Brook MacDonald and George Brannigan were on hand this week for the official opening of cycle tracks at Takapau School in Central Hawke’s Bay, not far from where both of the World Cup stars live. Takapau is the first in Central Hawke’s Bay to become part of the Bikes in Schools project and the 13th in the Bay area of New Zealand. Creating its own cycling tracks came as a direct result of a determined fundraising drive by the local community to gather the $50,000 needed. The tracks include a pump track, a skills track and a main 250m track for general riding. The fundraising also meant the kids have 50 bikes on hand as well as 100 helmets. The guys took time out to ride with the local kids on the tracks and sign autographs as well as speak to the local press. Earlier in the day some heats were organized to identify two of the school kids to go up against George and Brook, and they were given a half lap head start over the Trek World Racing stars. Taylor Topp and Guy Von Dadelszen were the lucky two, and held their lead until the end of the race. Both George and Brook were thrilled to be part of this project and look forward to seeing more of the school come on line with this important Bike in Schools initiative. Photo: Brook and George with Taylor and Guy after the race.